As reported in an article by Charles Arthur in the June 8, 1999 edition of The Independent in England, new information has been gathered by scientists at the Jawaharlal Nehru University in Delhi, India, regarding how the glaciers in the Himalayas are retreating. As we had explained, the glacier above Gangotri, from which the Ganges River starts, has retreated about one kilometer in the past 20 years or so. In fact, it has been determined that these glaciers are retreating faster than anywhere else on the planet. Professor Syed Hasnain, the main author of the report, relates that all of the glaciers in the middle Himalayas are retreating. He warns that many of the glaciers in this region could disappear by 2035. New fears are that the meltwater could produce catastrophic floods as mountain lakes overflow. As I explained in my book, The Vedic Prophecies: A New Look into the Future, the Vedic texts reveal that such holy rivers as the Ganges will dry up and become only a series of small lakes, at best. In this way, it may practically disappear, as did the Sarasvati River. This latest report surely seems to show the possibility of this happening sooner than expected. This also shows the reason that the origination mouth of the Ganges, at the ice cave called Gaumukh above Gangotri, is retreating farther away as the years go by. So those travelers who wish to journey to this mouth of the holy Ganga will have to travel farther up into the hills as time goes by. This also indicates why this mouth of the Ganges is always changing in its appearance. Getting back to the way the glaciers are retreating, at the University of Colorado in Boulder, a research team has found that the mountain glaciers are diminishing in the West as well. The Alps have lost nearly 50% of their ice in the last 100 years. The Major glacier at Mt. Kenya has lost 8% of its size, and 14 of the 27 glaciers in Spain are gone. The disappearing of the mountain glaciers is also reported in an article by Lily Whiteman in the January/February, 1999 issue of National Parks. It stated that there were more than 150 glaciers in Glacier National Park in Montana back in 1850. Now there are only 50, and it is expected that these will also disappear within the next four decades. This is primarily blamed on the increase in global temperatures by only one degree since the 1800's. Glaciers, because of being too solid and stable to show short-term variations in climate, are particularly good barometers of global warming. In regard to the Vedic tradition, it explains that the Ganges fell from heaven to earth and was caught on the head of Lord Shiva. This was to prevent the intense damage that the force of it would cause to the earth if it fell directly on to the planet. This took place at Gangotri, where the water backed up into the mountains where much of it froze. The course of the Ganges is said to still flow through the universe and come down to the earth planet. However, much of the river water comes from underneath the glacier. If the glacier at Gaumukh does continue to recede or melt away, and if the Ganges would ever cease its flow or begin to dry up, it would certainly mean the end of an era and a drastic affect on the Vedic spiritual culture as we have known it in India. Indeed, it would never be the same. I visited Gangotri again in June of 2007, and it was easy to see that the Gaumukh glacier is melting faster than ever. The water that flowed downstream and over the falls at Gangotri was really fierce. This does not mean that there was merely more water in the river, but that the glacier was melting faster than previously. There are a few reasons for this. One of the issues is that India is building dams on all of its rivers. Along the Ganga there is a dam at Tehri, which has created a green lake that backs up for miles along the river. As was explained to me, this lake now somehow attracts more rain to that area, leaving the clouds drained by the time they get up toward Gangotri. This also leaves the region of Gangotri and Gaumukh drier than before. This also prevents the Gaumukh glacier from being replenished with the rain or snow that it normally would receive. Thus, the rate of it receding away from Bhojbasa or Gangotri is increasing. This is not only from the general affects of global warming, but now also due to not being replenished by rains and snowfall that add water to the glacier. So some people are thinking that the Ganga may reduce its flow, or even stop flowing if this effect increases, in as little as 10-15 years. When I was in Gangotri ten years ago, the Ganga had a steady but kind of meandering flow over the falls. But now there is lots of water that descends rapidly and powerfully. The village people in the area are simple and feel that it’s just more water in the flow. They don’t see how this may indeed affect the future of the glacier. However, some people do understand that this is a bad sign over the long term, and that it may only deplete the glacier that much sooner. India is making electricity from its hydro-electric dams along its rivers, so much so that it is selling electricity to other countries, even China. Yet it is odd that they cannot even supply steady electricity to places like Gangotri, which is in a blackout about half the time. Other cities in Uttar Pradesh have a similar fate with regular blackouts. But the building of dams is causing environmental changes, the future affects of which are unsure. Thus, as the glaciers recede and dry, the source of the river water will begin to disappear. This was further explained in a New York Times article on July 17, 2007, by Somini Sengupta. D.P. Dobhal, 44, a glaciologist with the Wadia Institute for Himalayan Geology, has spent the last three years investigating the Chorabari glacier, the waters of which form the Mandakini River. He reports that the glacier itself has receded 90 feet in three years. 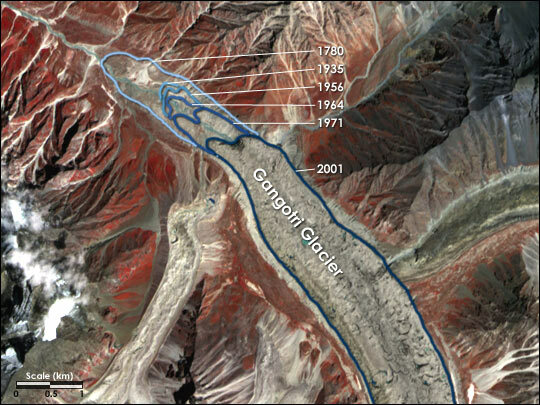 On a map drawn in 1962, it was plotted 860 feet from where the glacier starts today. The article goes on to say that a recent study by the Indian Space Research Organization, using satellite imaging to gauge the changes to 466 glaciers, has found more than a 20 percent reduction in size from 1962 to 2001, with bigger glaciers breaking into smaller pieces, each one retreating faster than its parent. A separate study found the Parbati glacier, one of the largest in the area, to be retreating by 170 feet a year during the 1990s. Another glacier that Mr. Dobhal has tracked, known as Dokriani, lost 20 percent of its size in three decades. Between 1991 and 1995, its beginning or snout inched back 55 feet each year. A vast and ancient sheet of ice, a glacier is in effect the planet’s most sensitive organ, like an aging knee that feels the onset of winter. Its upper reaches accumulate snow and ice when it is cold; its lower reaches melt when it is warm. Its long-term survival depends on the balance between the buildup and the melting. Glaciers worldwide serve as a barometer for global warming, which has, according to a report in 2007 by the Intergovernmental Panel on Climate Change, been spurred in recent decades by rising levels of greenhouse gas emissions. Even the Himalayas have grown measurably warmer. A recent study found that mean air temperature in the northwestern Himalayan range had risen by 2.2 degrees Celsius in the last two decades, a rate considerably higher than the rate of increase over the last 100 years. India’s public response so far has been to blame the industrialized world for rising emissions and resist any mandatory caps of its own. India’s per capita share of emissions is one-twentieth that of industrialized countries, the government points out, going on to argue that any restrictions on emissions would stunt its economic growth. And yet, as critics say, India’s rapid economic advance, combined with a population of more than a billion people and growing, will soon make it a far bigger contributor to greenhouse gases. More to the point, India stands to bear some of the most devastating consequences of human-induced climate change. In an October, 2007 edition of the Hindustan Times, there was an article called, "Gangotri Glacier Melting Rapidly," which explained how much the Gangotri glacier melted since 2004. Of course, we know that glaciers all over the world are melting away, but the Gangotri glacier is the main source of the Ganga River, which directly affects all of Vedic culture in various ways. Plus, the Vedic Puranas have also predicted that the Ganga will one day cease to flow and dry up, similar to what happened to the Sarasvati, which is said to now flow underground. In what is being termed a result of the first ever authentic study of the famous Gangotri glacier in the Garhwal Himalaya, the glacial landscape receded by 12.10 metres [or around 40 feet or more] in just one year since 2004. Incidentally, the river Ganga originates from the Gangotri glacier. It was the first of its kind study of the Gangotri glacier carried out using the highly sophisticated Global Positioning System," revealed Dr. M. S. Miral, a scientist at the Glacier Study Centre of the G. B. Pant Institute of Himalayan Environment and Development, Almora. "Before that, studies conducted on the Gangotri glacier were based on observations only." A six-member team of scientists from GBPIHED carried out the study. Dr. Kireet Kumar, head of GBPIHED's Glacier Study Centre, led the team. Dr. Miral attributed the Gangotri glacier retreating at an unusually fast pace to global warming. "Global warming has increased the atmospheric temperature by 0.6 degree centigrade worldwide," he said, adding even the Himalayan arc "is not untouched by the rising temperature." The rising temperature in the Himalaya did not just manifest itself in the retreating glaciers but also sent [increased] the snowmelt run-off of the region by several times. "The snowmelt run-off of the Gangotri glacier, for instance, had been recorded at a huge 57.45 cubic metres annually within just five years since 1999," said the expert. Similarly, the rate at which the suspended sedimentation that the snowmelt run-off of the Gangotri glacier carries with it, comes to around 17.78 lakh tons a year, which is dangerous for reservoirs like the Tehri dam, as it leads to a very fast sedimentation in these artificial water bodies. Dr. Miral said the Gangotri glacier "is receding so fast that even Gomukh, the snout of the Bhagirathi river, which is a popular religious destination for the Hindus, has ceased to resemble the mouth of a cow, for which its revered." However, in considering the information in this short article, we should also consider that when there is a discussion of global warming, it is a reflection of mankind's sinful or selfish desires and motivations. A simple and especially agrarian lifestyle does not produce the same level of pollution or causes for global warming. But an industrial lifestyle that depends on oil and the numerous artificial necessities that we have all become accustomed to, will certainly produce the pollutants and exhaust that will affect the environment at an increasing rate. If we worked harder at our spiritual development, natural realizations in our consciousness will occur that will guide humanity to a higher level of activity that will have a much less dangerous and contaminating output toward the environment and each other. This, of course, could lead into a much deeper conversation on the matter. But the point is that we are already seeing the affects on the Gangotri glacier, which will have serious and irreversible reactions on the Ganga River itself and the religious nature of life in India. It is further reported in the India Tribune (December 26, 2009) that in the village of Stackmo, Ladakh, 92 year old Phuntchok Namgyal remembers when they used to get water from the glaciers from April onwards, but now there is a water shortage even in early summer. The glaciers that did not melt during summer and would reach Stackmo are now receding further and further away. Professor Syed Iqbal Hasnain of the Energy Research Institute, and who has been studying the glaciers for several years, says that the future prospects on the Hindukush-Himalayan-Tibetan glaciers seem to be getting worse. He says that scientists project an average of a 43 percent decrease in the glacial area by 2070 and a 75 percent decrease by the end of the 21st century at the current rate. Tundup Angmo, climate change co-ordinator at Geres, an NGO active in the area, explains that glaciers in the Himalayas are receding faster than anywhere else in the world, at 70 meters per year. Pest attacks on crops are being reported in newer areas across Ladakh. Violent monsoons that cause damage to crops and the human habitat are also being reported in the Himalayas. Snowfall has also become less abundant, thus providing less water for the Indus River. This will also decrease the effectiveness of the hydro-electric power generators over the long term. However, Angmo explains that what is undeniable is the steady rise of the recorded temperatures over the past three decades. So winters are slightly less severe while summers are getting longer and warmer. "Apple orchards are also coming up at higher areas," she explains, all of which are not the norm for this area. So, though the Vedic prophecies explain that the Ganga and Yamuna Rivers will disappear in another 5,000 years, the changes seem to be taking place at an increasingly faster pace. It is also interesting that in 2007, many parts of India were affected by floods from the monsoons, such as in Gujarat, Bihar, Orissa, Kerala, Assam, etc. Yet, in places like Madhya Pradesh, they are facing an acute shortage of drinking water which has reached crisis levels. As reported in India Tribune, June 23, 2007, households of many towns in the vicinity of Bhopal are receiving only a trickle of water, and that only once in every three days. In the rural areas where water is only supplied once in a week, it is more alarming. When it is available, it comes through for only 30-45 minutes. Officials estimate that nearly 65 million people, or 70 percent of its population, are enveloped by this crisis. Furthermore, the quality of the water is also troubling, where sewage is getting mixed in to the water in many places, such as Bhopal. Bhopal is also hit by this water crisis, but mainly because of its population increase which has grown from 800,000 to 2.4 million in only the last decade. With such a population increase in just ten years, then it could grow to over 5 million in another decade. If other districts in India are growing as quickly, then the water crisis will only continue to spread. This brings to mind the predictions that, just as there may be wars over oil today, there will be water wars in the future. As the government of India is already rationing water in as many as 115 urban centers, tens of thousands of people are buying water from private sources. For example, six families in Bhopal are jointly purchasing water from a tanker for Rs. 500 every third day or so. But another problem that India is facing is that ground water levels have been receding for years, so much so that even thousands of hand pumps are no longer operational because they no longer can reach the water. Thus, this water problem seems like it will only increase if some serious strategy is not developed soon.